OK folks, hope you are all enjoying your Cinco De Mayo recipes, but I have not forgotten that Mother’s Day in only a few short days. 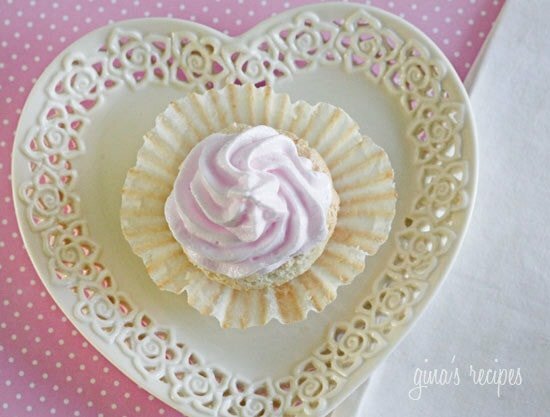 Why not make your Mom the sweetest, light and airy angel foods cupcake you’ll ever taste! 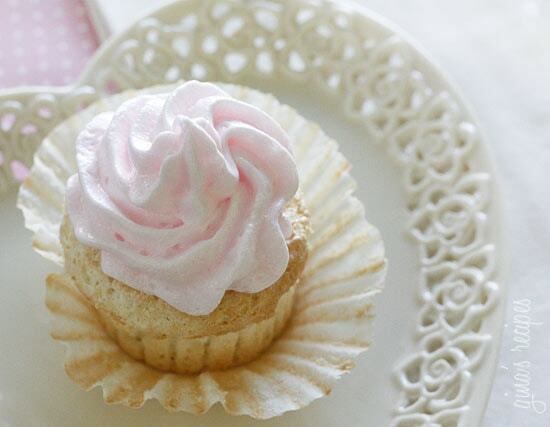 These deliciously airy cupcakes are made with love from scratch with egg whites, flour, sugar and vanilla and topped with a creamy, airy merengue icing that just melts in your mouth; the fact that they are fat free is just an added bonus. I’ve had my eye on these cupcakes from the Kitchn for a long time and when I finally got around to making them, they did not disappoint! Seriously, I will never buy an angel food cake from a box again. Probably for the more intermediate baker, a bit more delicate to make then using a box mix and requires a little more patience. But isn’t Mom worth it?! Take your time, add the ingredients slowly and make sure your eggs are at room temperature before starting. Meringues can be temperamental, start with squeaky clean metal bowls. Your patience will pay off! These are great for special occasions, but remember, they are made with sugar so I wouldn’t eat these every day, but once in a while it’s OK to indulge. I am not sure how these would work out with Stevia or Splenda, if anyone tries it leave a comment and let me know how it turns out! Heat the oven to 325°F. Lightly grease a muffin tin with baking spray or line tin with cupcake liners. In a medium bowl whisk together the confectioner’s sugar, cake flour, and salt. In a large bowl mix the egg whites, water, vanilla extract, and cream of tartar. Using an electric mixer or stand mixer, mix on low speed a few minutes until foamy, then turn the speed to medium and slowly add the granulated sugar in 1 tablespoon increments, very gradually over a period of three to four minutes. When all the sugar has been added, turn the speed to high and beat for an additional three to five minutes, or until the mixture forms medium peaks. Don’t beat until the mixture is extremely glossy and stiff; it should be modestly glossy, but the very tips of the peaks formed when you dip your finger in should flop over just a bit. Add the dry ingredients in two installments; sift the dry ingredients through a fine mesh strainer, tapping them through and into the egg whites. Fold carefully, do not over mix. Fold in the second half of the dry ingredients. Spoon the batter into the prepared baking pan. Bake for 18 minutes or until the tops are slightly golden. Remove from the oven and cool completely before removing and icing. Place the egg whites with the vanilla in the clean bowl of a stand mixer. In a small, high-sided saucepan, whisk the water and sugar together. Bring to a boil over medium-high heat and cook for four to eight minutes, or until the syrup reaches 234°F on a candy thermometer. While the sugar syrup is boiling, whip the egg whites on low speed until they form foamy peaks. When the syrup has reached the correct temperature, slowly drizzle it into the egg whites, turning the speed to medium-high as you do so. Continue to whip until the egg whites form stiff, glossy peaks. Beat in the salt and food coloring until the mixture is an even, consistent shade of pink. Fill a piping bag and frost cupcakes. I would like to use this recipe and maybe combine it with another for a funfetti cake recipe using four 6 inch cake pans.. what would you recommend for how long and at what temperature to use? Gina – I just made these and they are fantastic. I would note though, that using the recipe builder on WW, the cupcakes alone are four points and then icing adds another two points. I am not sure how to get the cupcake itself down to two points, as even 1/2 cup of sugar is 24 points…so just that without any other ingredients makes the cupcakes 2 points. Then you still have to add in the powdered sugar, egg whites, etc. Gina what if you dont have a candy thermometer what else can you do ? Gina what do you do with all the yolks from the eggs? do you have a recipe you use them in ?.Love this cupcakes and your blog . They taste good, but for me, they could be a little more airy. 1. When heating up your sugar mixture, you cannot use raw sugar. It won't work at all. 2. When heating up your sugar mixture, you must also be careful not to allow ANY COLOR to infiltrate it; 4 – 5 minutes is more the appropriate length than 4 – 8 if you have your burner on medium high. 3. You must also allow the mixture to cool for about a minute before attempting to drizzle it in, otherwise it won't work and your icing will come out liquidy. 4. If you don't have a stand mixture, prepare for about 10 minutes of mixing this on high while standing in your kitchen attached to the mixer. I include this step mostly because I don't want you to let 3 – 4 minutes go by and think "what have I done wrong?" Nothing – it just takes forever. 5. Afterward, you should have a very lovely frosting. I stand corrected… still didn't work. Just used another recipe altogether for the frosting. Well, the icing was a disaster. I followed the instructions to the letter and ended up with liquidy icing. I couldn't even get soft peaks out of it, let alone stiff. Really disappointed. Also, I am finding that as others have said, the batter REALLY sticks to the liners and yes, they even come out SMELLING like eggs… not appetizing at all. They taste fine, but still. I do appreciate how moist they are, though. No idea what I'll do about the icing. Disappointed that so many people seem to be having difficulty with it, including myself. I was looking forward to having these ready tonight, but I doubt that will happen now. Did anyone make these as a cake? I see a few comments about using a bundt pan. That's what I'd like to do. Do you need to make any adjustments to the recipe? Hi I'm confused… Is it 87 calories each without icing? Or is the icing an additional 87 calories? How much do you fill the cupcake liners? 1/2 or 2/3? since the cake tends to puff up, I 'd love to know! I'm joining the 24 cupcake club! I just made these and they look great (I'm dying waiting for them to cool!). I'm topping mine with fresh fruit and sugar free cool whip (like mini strawberry shortcakes). I confirmed the recipe in weight watcher's recipe builder, and if you make 24 cupcakes they are only 1 point plus each without frosting! How amazing is that?! I can't wait to try them, thanks again, Gina!!! I made these tonight… It took about 2 hours, but I have never made cupcakes on my own before and angel food cake is harder to make (I believe). I messed up when mixing the dry ingredients into the egg mixture. I took "Fold carefully, do not over mix." way too seriously. I tried mixing at the LEAST I could and later I found the cake flour wasn't completely mixed in… The ones with chunks of flour in them didn't taste as good. XD I didn't care for the frosting and neither did my mom. They taste better cold– in my opinion. These were also really sweet, I wonder if instead of using 1/4 water, I could use 1/4 cup milk so there won't be such an "eggy" taste and maybe I could lower the sugar amounts too. Anyone looking here, how good are these? I want to make these for my mom on her Birthday. Are they better hot? Can I put the frosting in the refrigerator? Man oh man, I just made these only I made one major mistake- i used 2 cups of flour instead of 2/3's!!! They turned out like cardboard. Since these are for my wine club tasting tonight, I will be starting on round 2 right about…now. Wish me luck. You have an awesome site. It is a great ww resource! Made these cupcakes today for mothers day but used strawberries instead of frosting. tasted great! My boyfriend loved it and couldn't believe it when I told him it was low calorie. My batch ended up making me than 12 cupcakes but still tasted amazing and wasn't "eggy". Can't wait to try the frosting another time. I did everything in the recipe, although my cupcakes turned out slightly eggy and a bit too moist… I think it was either too humid or I didn't beat the egg whites enough. I tried a second go around and the same thing happened though… Any idea on how I can improve the results? Sometimes it helps to add some cream of tarter to egg whites in meringue? Most recipes call for that because it makes egg white stiffer. It also helps to make sure that the peaks are actually stiff and not medium stiff or soft. They should stand up on their own when you lift the mixer. Lenny – I had similar problems with mine, even though I followed the recipe exactly (even down to using real sugar). I tried baking them a few minutes longer when I cut into my test cupcake, but it didn't seem to help. I wonder if more vanilla might mask the eggy taste a little better. 1) is cake flour plain or self-raising? I have to buy gluten free, and in the UK I've never seen a gluten free cake flour. 2) could I freeze these (un-iced)? What about putting some strawberries in a blender and adding that to the frosting? 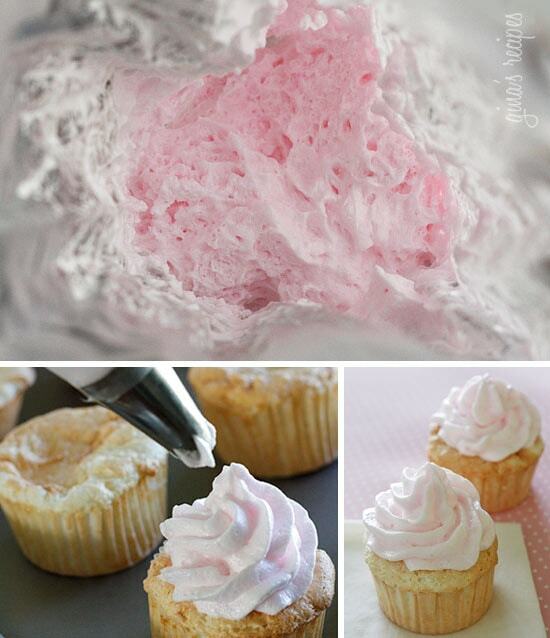 You would have to adjust the sugar to stiffen the frosting, or if the strawberries are sweet enough, you can pipe a thickened strawberry syrup into each cupcake. I am totally making these for Valentine's Day! I could just put this same recipe in a 9 inch round cooking pan…right?? I just made the angel food cupcakes, and they taste great! They did shrink though, so I think next time I will put more batter in the cups and bake them a minute or two longer. I think maybe they needed another minute on the baking. I am used to other recipes calling for too much time and the cupcakes get over baked. I have not tried the frosting yet but I plan too. Gina's cupcakes looks the yummiest cupcakes ever. Thanks for sharing this recipe. I made these tonight, they are delicious! I left off the icing and served them with strawberries and FF whipped cream. Thanks for such a great recipe! You should whiff the egg whites until they are stiff so that it will stand up when you put it in the cupcakes. It also helps to refrigerate them for an hour before you put it in the cupcake. Thank you for teaching us how to make these. I still have problems making the meringue stand up like yours. How did you make the meringue stiff for them to stand like that? Hi, thank you for all the recipes! I tried making these earlier but they've been a disaster 🙁 I ended up with so much mixture – more than double even with cases filled to the brim – and they came out really eggy (I know they're meant to taste a little more eggy than normal cake mix, but this was way too much), and the texture was not like any sort of sponge at all – more like a chewy souffle, some of them with slightly raw centres even though they were cooked on the outside (and left for the time indicated minimum). I followed your recipe to a T, other than substituting the sugar for Splenda. Have you got any idea of what went wrong? I really want to make them again, more successfully! Doesn't just look delicious, they're very presentable. Joey- since they are mainly egg whites, perhaps it's just not what you were expecting. I don't know what I did wrong but my cupcakes had a horrible egg taste to them. I thought maybe I undercooked the first batch so I slightly overcooked the second and could not eat them. The icing was devine. Any ideas why I had this issue? I followed the recipe to a "T". I also got twice as many out of the recipe, but that's fine with me! They taste good and are less pp this way, haha! I made these and they are delicious! I also got 24 out of the recipe, did I do something wrong or was it just how I whipped the egg whites? I love your recipes! Everything I have tried has been wonderful! Thank you so much for sharing. They are in the oven as we speak. I've got a friends BBQ for the end of summer, and since I'm doing weight watchers I wanted a dessert even I could enjoy. One recipe made 24 cupcakes for me, so that's fantastic, it means I can try 1 or 2 before the BBQ. I can't wait to see how they turn out with the frosting. All of your recipes for cupcakes, can they be turned into regular cake? If so, would you just divide the batter up in half and bake two layers and all of that good stuff? I realize too one would possibly have to double the icing, but I'm not a huge icing fan, and wouldn't really miss it. Trying to find a recipe for a different take on a birthday cake, other than chocolate with vanilla icing! Made these today and a trial run for a wedding shower that I am baking for. They were awesome! I'm going to make them in heart shaped muffin cups for the shower 🙂 Thanks! Cake flour is made from a softer wheat than all purpose flour. I keep several flours on hand for different recipes depending on what I am making. I LOVE angle food cake….thanks for another spectacular idea! Mine stayed out overnight and were fine but the weather was still cool. Now that it's hot I am not sure how it would effect the frosting. After they are frosted, can they set out overnight or do they have to be refrigerated? It's cake flour, they sell it in the supermarket, baking aisle. Don't overfill the cupcake liners. Where do you find cupcake flour? And how do you keep these things from not boiling over? These were so light and nice. I did end up making these for a treat for my mother for mother's day! So pretty too! Hi… Thanks for your blog! I love it and have been cooking many of your recipes. I decided to try this with mini-muffin pan. I reduced the cooking time to about 14-15 minutes. They taste great, but look a little funny because of the small size and fluffiness of the batter. I am not going to bring them to the event I was planning on b/c of appearance, but I assure you that all of them will be eaten! McDorky- Congrats on the baby! I'm happy to help! Happy you all liked them!! These were regular sized cupcakes, they do stick a little to the paper but not terribly so. Bri, I will check and get back to you. I want to say Wilson. Glad to know these worked with Splenda, thanks for sharing! Gina I made these with Splenda for my Mom for Mothers day and they tasted fine. As for the frosting I don't think I must have beat the egg whites long enough cause the frosting when flat on them. Also the papers stuck to them. Otherwise they were fine. Love your recipes. Keep them coming. Those are BEAUTIFUL. I especially love the plate you put them on. 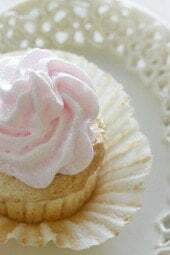 What women wouldn't love a white cupcake with fluffy pink icing?? Mmmmm. 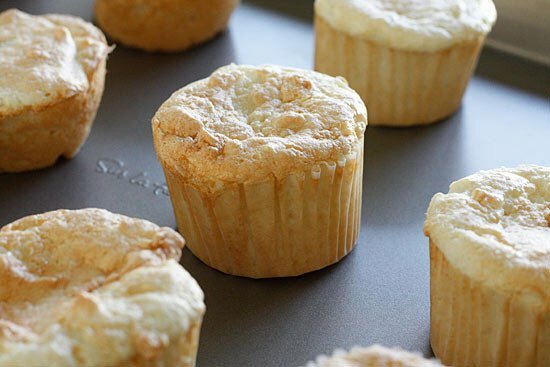 Question – did you use regular size muffin tin or mini-muffin? Oops – should be corn STARCH – sorry. 2 tbsp of corn start to 1 cup of flour. Mix and/or sift together. Sorry for the confusion but do you mean if the recipe asks for 1 cup of cake flour, put in 2 tbsp of corn starch INSTEAD of each cup of flour? Or do you mean put in 1 cup of regular flour along with the 2 tbsp. of corn starch? Made these today for my hubby's birthday (blue!) and they are yummy! Mine totally filled/overfilled 24 regular sized muffin cups though – and then shrank a bit as they cooled – still look and taste great! Think I beat them too much?? I'm sure I measured accurately! Gina, these look so tasty and your photos are fantastic! Beautiful! What brand of cake decorating supplies do you use? I've tried sooo many different kinds when frosting cupcakes but they never work well. How about the icing? Should that be done the day of? Looks yummy! Gina, this looks wonderful — the icing especially! Can't wait to try it! And for the person who wanted to substitute all-purpose flour, I learned from personal experience that it will produce a different cake. Apparently cake flour (like Sofsilk) is different in both protein and in gluten than all-purpose flour and thus will result in a less tender cake, sometimes with a different taste. I would highly recommend using cake flour for angel food if you can, since it is supposed to be a light, very tender cake, which is what makes it delicious (though less filling hahaha). According to "Still Tasty" http://www.stilltasty.com/fooditems/index/16356 it should last 1-2 days at room temperature. We ate them the second day and the were still great, but I probably wouldn't go longer than that. Gina….how far in advance do you think I could make these? I would love to make these for my daughter's College Graduation Party…without the icing, but with fresh strawberries! I would need lots of them, obviously! I made these yesterday. They are fabulous! I used mini cupcake pan without liners. I could not get a consistent size. I wasn't sure how far to fill each tin. I really don't like to back but when I saw these I HAD to make them and I am so glad I did!!!!! Thank you so much for this site, I visit often and make many of your recipes! You never disappoint! Alicia, a hand mixer would be fine. Vee and Dee – yes, I put the liners in the cupcake tin. Michele, I'll try to post more soon! Alisha, I don't really know how it would affect it but make sure you sift it before you measure. The hot sugar syrup cooks the egg. I plan on making these for mothers day.. at the store today I bought some beautiful strawberries and i found FF reddiwhip.. Skipping the frosting and going for strawberry shortcakes!! Cant wait for everyone to try them. Thanks! My mouth dropped when I saw these. I've been dying to make cupcakes lately…. Great translucent pink frost looking cupcake! two questions- if i don't have baking flour, what do i do? and i'm weird about undercooked egg/bacteria stuff, so does the heated syrup cook the "raw" part of the egg white??? i've never made a meringue like this- always cooked it in the oven on top of the pie. It's so odd, I just made these for my own blog this past weekend and posted them last night!! And here I thought I had come up with this great original idea!! I injected mine with blueberry pie filling so I guess it is a little different…but that's such a weird coincidence! These look wonderful! I love the pink frosting. Yum. I don't know why I've never thought to make angel cake into cupcakes. Seriously, why haven't I thought of that. It seems so easy and common sense. Yum! Hey Gina, do you bake these in muffin tins with liners or just a baking sheet with the liners sitting on it? Can't wait to try them!! I just found your site and I am LOVING it. New to Weight Watchers and post baby… so these are soo helpful. I would LOVE to attempt this for Mother's Day, but I do not have a stand mixer. Do you think I could get the same results with the frosting with just an electric hand mixer? Emily – I believe it's made from softer wheat and it' sifted, I'm not sure how it would change if you use regular flour. I like to keep a box of cake flour on hand. I know this is an older post but I just saw this. Cake flour has less gluten so its used for cakes so they are more tender. Shouldnt really be substituted. These look fantastic! I have been looking for a good dessert for Mother's Day because I am having my mom over for dinner and these would be just perfect! What exactly is the difference between cake flour and all-purpose flour? Can AP flour be a replacement for cake flour? For 1 cup cake flour you can substitute 7/8 cups AP flour plus 2 Tablespoons corn starch. Since you only use 2/3 cups cake flour in this recipe, I would put 1 Tablespoon plus 1 teaspoon of corn starch in a 1/3 dry measuring cup. Add AP flour to the cup and level it off. Measure another 1/3 cup this time with only the AP flour. This will give you 2/3 cups of cake flour substitute. I have used this substitution for angel food cake before and the cake comes out fine. I love baking and giving some to my mother in law….I will definitely be making these for her. They look absolutely gorgeous! These look amazing but I am not the baker in the family so not sure if I will be making these. I would use real eggs, not from a carton. I've had some good experiences with egg whites from a carton but also some bad so I wouldn't waste your time. Can I use egg beater egg whites instead of whites from actual eggs? So thoughtful and delicious idea for mother's day. Thanks Gina for such beautiful recipe! Thanks Rosemary!! I'm not sure which takes longer, cooking or the photos!! Cait, it's so worth the extra effort. My family loved the icing. Tastes like marshmallow! I want to make these for a picnic party and am wondering how the meringue frosting will do outside and if it needs to be refrigerated?? I usually love your recipes…but this one took a LONG time to make and tasted really eggy. Didn't like it at all. Not sure if I did something wrong…but I followed the directions to the T.
homemade anglefood cake usually does taste eggy! I love angel food cake! I've never made it from scratch.. but I didn't know how simple it was, either. Trying this soon! Gina, you have the prettiest presentations, truly artistic. Thank you for your care.